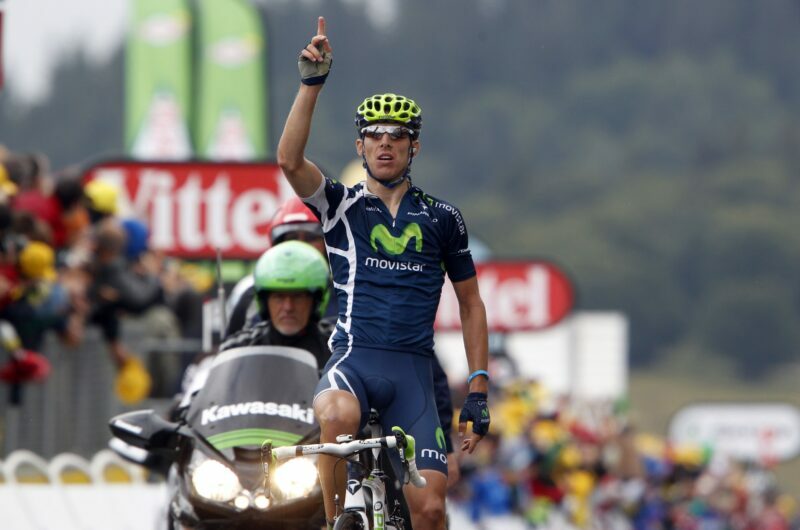 The first year of the Movistar Team project ended in resounding sporting success and exquisite image. Stage victories in all three grand tours, constant presence on front in all competitions… Only the death by Xavi Tondo, the serious accident by Mauricio Soler in the Tour de Suisse and endless injuries and illnesses overshadowed a sporting-wise outstanding 2011 season. Fran Ventoso – with JJ Rojas in the background- wins the hardest stage of the Tour Down Under. José Joaquín Rojas hugs David Arroyo after winning the Trofeo Deià. The late Xavi Tondo on the final podium of the Vuelta a Castilla y León as winner of his last race. Fran Ventoso took Movistar Team’s first GT success on Giro d’Italia stage 6 in Fiuggi. Vasil Kiryienka, winner of the Alpine Giro stage in Sestriere, points to heaven for Xavi Tondo. Mauricio Soler won a stage and led the Tour de Suisse days before his accident. José Joaquín Rojas, spanish road race champion against Alberto Contador in Castellón. Rui Costa won stage 8 in the Tour de France atop Super-Besse. Victory in the Vuelta a Burgos ITT, one of the fastest in history. Pablo Lastras completed the GT triple winning in Totana and becoming the new Vuelta leader. A memorial for Xavi Tondo as the Vuelta crossed past Sierra Nevada where he passed away. Rui Costa crowned a brilliant season in the Grand Prix de Montréal.